Five years after the Daugherty made its appearance on the market, an improved version of this machine was produced with a new brand name: Pittsburg. The Pittsburg 10 was only slightly different from earlier Pittsburg models, of which the exact model indication is unclear. Several variations of the Pittsburg 10 (and earlier) are known. 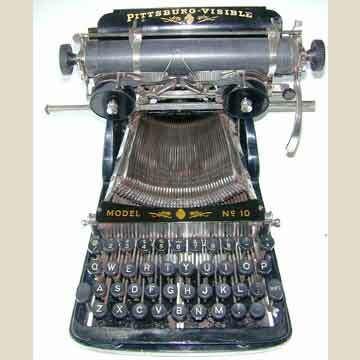 The earliest Pittsburg is supposed to have resembled the Daugherty most clearly, with the same nickel-plated space bar with integrated shift keys, nickel-plated ribbon spools and the uncovered type basket. Later on, the integrated shift keys were replaced with regular shift keys, the ribbon spools were painted black and a name shield appeared over the type basket (with the model indication). Other minor differences include the replacement of the screws holding the type basket in place, with clamps. The Pittsburg 10 stayed on the market until 1908, when the more common looking Pittsburg 11 was introduced. Also see the book â€œTypewriterâ€�, page 106.